Here are a couple of additional S.T. 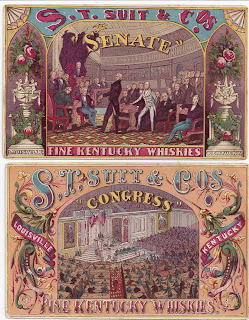 Suit & Co. trade cards. This one is keeping with his "political theme" in the naming and marketing of his Kentucky whiskies. We have a Capitol, a Senate, and Congress brands. Others?? 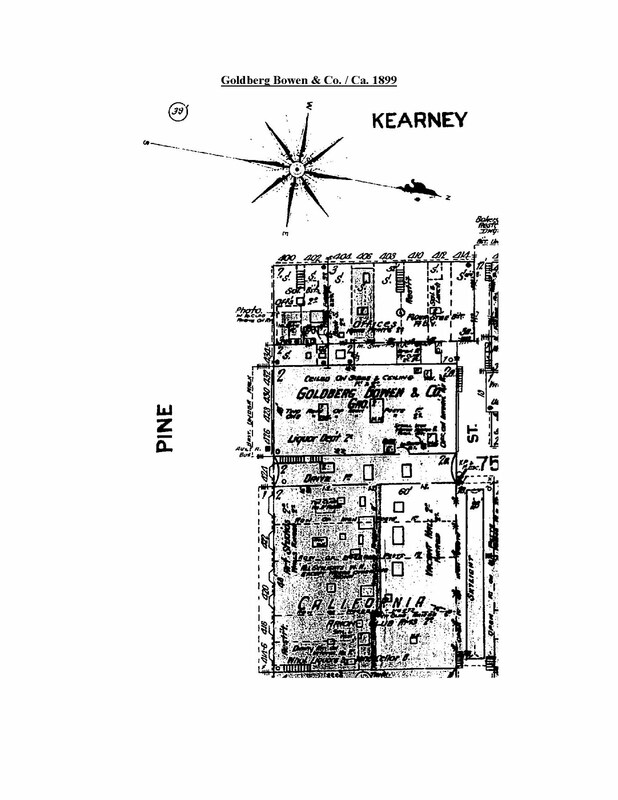 Suit purchased a large tract of property in Maryland, near Washington D.C. in 1867. This farm later became known as "Suitland". It is now basically a suburb of our capitol city. This card has been trimmed of the words "fine Kentucky Whiskies". This was a fleabay pickup a few months ago. I don't know what this building is or was. Possibly his warehouse in Louisville. Suit attempted to corner the market on fine bourbon in 1872, but ran into difficulty. His new warehouse, while under contruction in 1872, had a section collapse due to a design flaw I presume. Before they could get it reinforced and shored up a strong windstorm reduced the entire structure to a pile of rubble. Jordan, Giles & Co. were successors to Suit in Louisville in 1873. The Suitland farm, and products from that operation, became very popular in the 1880's. My tradecards do not have the name of a liquor dealer or company on the reverse. I have kept a sharp eye out for some of these cards with the name of our 'local boys' on the reverse. WALKER BROS.
Well, last month I saw what I'd been hoping for the past 32 yrs.... a "SOLD" sign on the front of the places. A few phone calls later, my partner and I had permission to dig ! The 'waiting game' finally paid off. I had outlasted the wicked witch from the far east ! This past Saturday we headed out for the town and the lot. The only downer was that there were now 2 concrete carport slabs in the backyard. When I first scoped-out the place 30 + yrs ago, it was wide open. A closer look revealed a 3 foot wide dirt boarder around 3 sides of the slab. I just KNEW this place had to have good bottles..... it had to. If you wait 32 yrs, something good has to be cooking in there for all that time, or so we seem to always think ! I had to stay optimistic, since I was determined to get bottles from that yard after waiting so long. I probed one side of the strip next to the slab, and my partner probed the other strip on the West side. Bummer, there was also 'fill' added to the lot, probably when they put in the carports. Geez.....I was now thinking, "can this dig get any worse" ?? Oh, and if you guys know what 'clean fill' is... this wasn't it. The fill was 2-3 feet deep and consisted of a foot of broken concrete pcs on top followed by dirt with rocks below. About an hour later my partner announced he had 2 privy sites located in the strip on the West side that he was working. It took him an hour of attempting to snake the probe around all the BS to thoroughly probe the 50' long narrow 3' wide strip. After throwing chunks of concrete off of the top of where the 2 privies were located, shovels were now whaling dirt from both holes that were opened-up simultaneously. The hole closer to the house site appeared newer right off the bat, with lots of evidence up high. Not a good sign, in two respects... new and possibly ABD. The other hole was a little further back and was clean until about 4 1/2 feet, where it broke into a layer of bottles layed-in side by side. They were mostly late 80's -early 90's, and the best part was it hadnt been dug. It was non-ABD ! The first pit continued to produce nothing but shards, and upon hitting the bottom at about 7', we officially declared it 'Double ABD" ! My partner in the non-ABD hollared out... "I got an embossed coffin flask" ! That's always exciting, as any seasoned digger knows they turn-up far too seldom, and you're always expecting every coffin to be just another 'slick'. I'm hovering over the hole now, just like an over zealous property owner does to us on occasion, trying not to give my partner a dirt pile shower. He holds it up, and it's an intact clear slug-plate Phoenix coffin, and we agree that things are now looking up. it to be a broken S.H.M. and announce the news to my partner. He pauses and looks up at me in amazement. Things have now changed once again for the better, as we both realize we are in a potentially high-powered whiskey hole ! More 70s bottles come out, meds, several hairs, and utilities. I jump back into my hole and polish the bottom off shortly soon after, as it was only 4' deep and very sparse. Pulling down the upper walls, I come across a broken Garland's Cough Drops in killer dark fire aqua with a single collar flying saucer top that has a sloppy long drip on one side. What a gem that one would've been ! Moments later, I hear the all too familiar shout "I got another fifth showin". I quickly jump out again and watch the slow process of digging a round the bottle. This time he can see the Fleur de Lis monogram and we both know it's another S.H.M. Meanwhile, hearts are pounding ,until he gets just below the shoulder on one side and says "it's broken". Looking at it, I could see it was from the exact same olive colored batch of SF glass as the first broken one, and even more amazing, probably was from the same batch as another olive example I found nearby over 25 yrs ago. We're bummed, but know there is still more hole left. Minutes later another whiskey comes out, and this time it's whole, but it's just an unembossed 1/6 with a gnarly off center glob top. A good find on any normal day, but not when you are digging S.H.M. 's in olive green-amber !! Even though we didnt score the killer intact 1/5, the "waiting game" still paid off for me. Just finally being able to dig that place, know what was buried there, and to have all the fun and excitement of almost finding 2 olive S.H.M's was worth it in itself. Whether it be digging, or waiting for a good 1/5 to come your way to purchase, the "waiting game" is a necessary evil, and more often than not, worth playing ! Comparison photo of one of the recently dug broken S.H.M's and another example found 25 yrs ago nearby...most likely from same batch of SF Glass. Could there be more ??? I believe that the bottle use to sell the Suits products were the shoulder embossed bottle that just says S.T.Suits. There has been a few of these found in Northern California. Yesterday, while pawing through a pile of trade cards with puppies, kittens, and anything else that my three year old grand daughter found interesting, I stumbled across a San Francisco newspaper ad from 1872 that I had forgotten about years ago. Talk about uniting east and west! The association of A. P. Hotaling with Milton J. Hardy and C.P. Moorman has been well documented by Thomas in Whiskey Bottle of the Old West. The discovery of this ad just ties up the loose ends a little more neatly and also adds a positive date stamp to the relationships. The ad plainly pictures the embossing pattern found on Barnett #'s 234 & 235 / Thomas #'s 37 & 39; J. H. Cutter Old Bourbon and J. H. Cutter Pure Old Rye - C. P. Moorman. while the base embossed MJH has always been something of a mystery. To the best of my knowledge, all the base embossed MJH's have been dug in the west. The cylinder has all the earmarks of being blown on the west coast and my guess is that they were blown at Hotalings direction and paper labeled for a period of time until Moormans Cutter A. No 1 and Cutter OK whiskies began to gain a foothold. OK, so much for neat tie ins and killer glop tops. What really tripped my tigger was what I spotted on the reverse side of the ad, neatly hidden away in the middle of the page. Check out the plug by W.W. 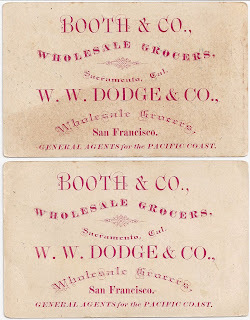 Dodge and Co., with offices in both San Francisco and Sacramento. Anyone up for digging an S.T. Suit? The possibilities are endless! I wanted to wish everyone a Merry Christmas, and a happy New Year! I appreciate the relationships I have developed in this wonderful hobby. Thank You! Well, it would've been too cool if this one had survived its dip in the wet privy pool ! Yesterday was the first time I'd ever turned pieces of this extremely rare glob-top fifth. At first I wasn't even sure which fifth it was, then my partner pointed out the diamonds on the sides, and that put us on the right track of diamonds...... to jewels. Only got about 2/3's of it, but that was enough to get the blood pumping, as it came out soon and up high in the hole. Of course there's always some kind of a "hook" to get you to dig a nasty or difficult hole, but it's usually not of such a high caliber as a John S. Bowman Jewel Old Bourbon Sole Agents S.F. The bottom layer was '70's, but no bourbons were to be found from that era.... not even pcs. The guy was strictly a wino and an ale drinker in the '70's. The Jewel may have been a gift from someone to celebrate a birth or something in 1886, as this bottle was made only in that year. Surely if he was a real bourbon drinker, a few Cutters or Moore's would've been part of the mix ! The base has a dimple in the center of an 8-pointed ray or star. 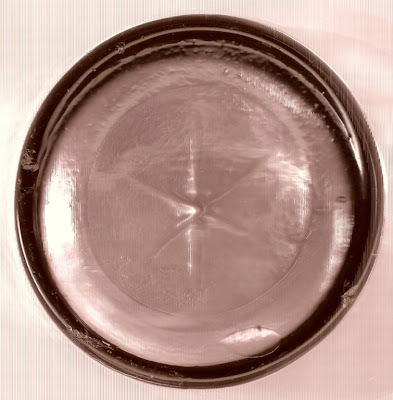 These appear to be "western blown", as the glass became very sparkley after scrubbing the mud off, and the star is similar to those found on earlier Western unembossed fifths. My count is seven intact examples of the Jewel Old Bourbon. There is also a very similar amber pint coffin flask, but for some reason is embossed "Old Jewel Bourbon" instead of "Jewel Old Bourbon". This brand has a really crazy distribution pattern (basically no pattern at all ! ), as whole examples of the flask and fifth have turned-up mostly on singular occasions all from different towns throughout Ca, Nv, and Az. I'm not aware of any being found in different holes in the same town. Last evening a very scarce and sought after glop top closed on ebay. Listed as "Livingstone's Western Glob Top Whiskey w/whittling Rare" lot number 360214238214, it should have created a veritable feeding frenzy. Opening at a reasonable $1200~, I'd expected it to bring at least $1750~. Instead, only two bidders competed for bragging rights and it closed at a weak $1225~. Initially described as "Livingstone's Whiskey bottle, a western glob top, with whittling" there was no mention of condition. Later, in a belated attempt to more accurately describe condition, the seller added the following " It is free of chips and cracks with the following exceptions: in response to a bidder request, we re-examined this bottle and found three small nicks or "flea-bites" on the bottom, on the rim. We are including a scan we did of the bottom, to better illustrate these small defects. Imagining that the base is a clock dial, the largest nick is at about 9 oclock. There is a tiny flea bite at 11 oclock and there is one other slight nick at 4 oclock. The football shaped object towards the bottom of our clock dial is an embedded bubble. The only other defect in this bottle is on one side, near the seam, about 3/8" from the bottom, a tiny pin-prick which appears to be a tiny bubble that "popped." A poor quality black and white scan of the base was also attached. Ya just gotta love these technical descriptions... Big flea? Little flea? Happy flea? Flea with a bad attitude? Come On! In an attempt to nail down the true condition, I emailed "In regards to the Livingston Blackberry Brandy; You state ""flea-bites" on the bottom, on the rim. Could you please provide dimensions in regards to the described damage? IE: "largest nick is at about 9 oclock, measures 3mm in length, 2mm in width and is 3mm in depth". I've found that detailed, subjective descriptions take all the guess work out of a purchase. The bottle is fairly scarce but damage to a higher end western whiskey can make or break the desirability. I never heard back in regards to this inquiry or a follow up. Was the seller out of town or just trying to let the cards fall as they may? Guess we'll never know. Having been bitten more often than I'd care to admit on ebay, I opted not to place a bid until I heard back. JUDGE THROWN IN PRIVY HOLE IS RESCUED BY BOTTLE DIGGERS ! Yes, this Judge, after being thrown under the privy bench over 120 years ago, was recently rescued from a well hidden, shallow pit in Northern Ca. If it wasn't for the efforts of my partners and myself launching an intense 'probathon', the Newmark Gruenberg Judge would've remained silenced for another generation. He's now granted himself probation and resides under house arrest on my whiskey shelf, in between his predecessor Kane-O'Leary, and his much younger successor, S.B. Rothenberg ! After the gavel was passed to them from Kane-O'Leary in late 1882, Newmark Gruenberg served up Old Judge Bourbon from the bench only from 1883-1885, , . In 1886 Gruenberg bought out Newmark and had his own bottles made for a year or two. This dig was exciting, as it was filled with anticipation after waiting many years to explore this site. A recent change in ownership prompted a renewed effort that resulted in successfully obtaining permission to hunt for old bourbons and other Western preparations. A very sparse older pit yielded a broken var 1 JF Cutter in light olive-amber and a few very early S.F. Jamaica Gingers, which coincidentally seem to often hang out with Western liquor containers. Out of the many bottles and relics recovered from numerous pits, the Old Judge was the lone intact fifth, and probably only survived because it was on the front side of an already sparse pit. Hopefully, this will be the start of a run of intact Western fifths ! As many of you know, I developed a penchant for hoarding and displaying honest labeled western whiskies back in the seventies when most folks were scrubbing the labels off the bottles in order to better appreciate the glass. Me, well, a simple mind equals simple pleasures. It didn't take a rocket scientist to figure out that paper rots away long before glass. And contrary to what I used to tell my wife (back when I was young enough to care), I really didn't read the articles, I just looked at the pictures~ To me, the western whiskey label is the centerfold on the bottle and the rest is, well, pretty much just an article. A while back I posted an article about the labeled and embossed Tea Kettle that showed up on my doorstep. Never a day goes by that I don't pay my respects to Shea, Bocqueraz and McKee for that bit of sunshine in my collection. Too tell the truth though, my all time favorite was produced for Jacob Goldberg, Charles and Henry Bowen, and Louis Lebenbaum. 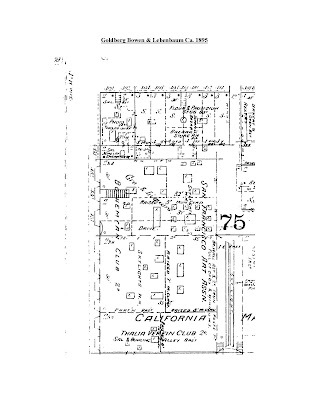 The firm of Goldberg, Bowen & Lebenbaum was in business for a relatively short period of time (1892-1895), and were located at 426-432 Pine in San Francisco. The firm was officially listed as Importers of Wines And Liquors and Commercial and Retail grocers. Their grocery outlets were located at 432 Pine and 215 Sutter. 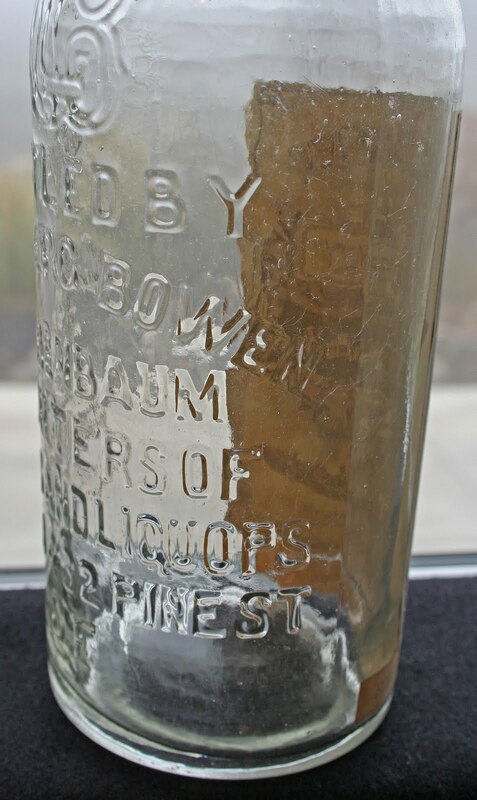 In 1892, they contracted with a German Glass factory, (probably Gerresheimer Glashuettenwerk of the Dusseldorf region) through Abramson - Heunisch Co. of S.F., who were jobbers of bottles, corks etc., etc. and had a run of clear applied top cylinder fifths blown. 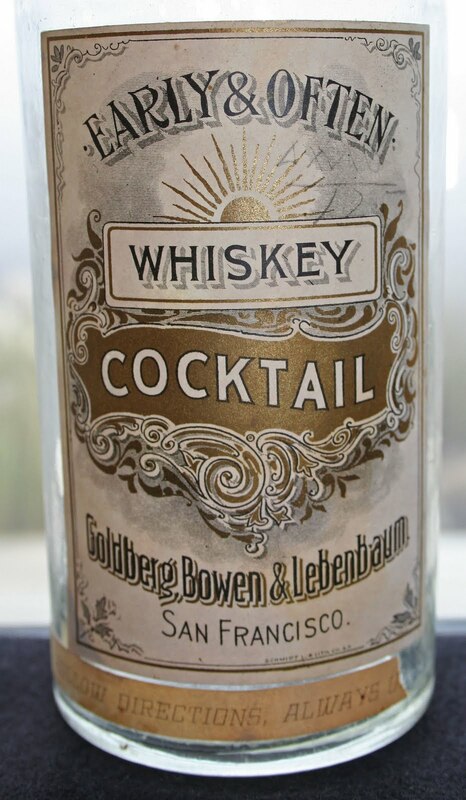 The bottles were embossed "Bottled By / Goldberg, Bowen, / & Lebenbaum / Importers of / Wines And Liquors / 426 To 432 Pine St. / S. F." A large company logo is located above this at the shoulder at the top of this full faced embossing pattern. 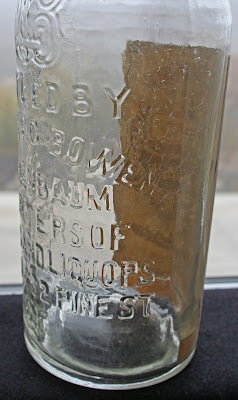 The quality of the bottles left something to be desired and most all display with small flashes or checks and other production related issues attributable to poor annealing at the glass factory. Most of this variant are also heavily whittled and display with extreme crudity. One small production run was produced with a mis-spelling and Liquors is spelled Liquops. It is estimated that fewer than a half dozen of the mis-spelled variant are in collections at this time. They contracted with L. Schmidt & Co. / lithographers to have a label plate cut for a new brand of whiskey called Early & Often. The neck label has directions for the "proper use" of the product and the main body label pictures typical Victorian scroll work and the sun rising above the main body of the label. .
Lebenbaum left the partnership in 1895. 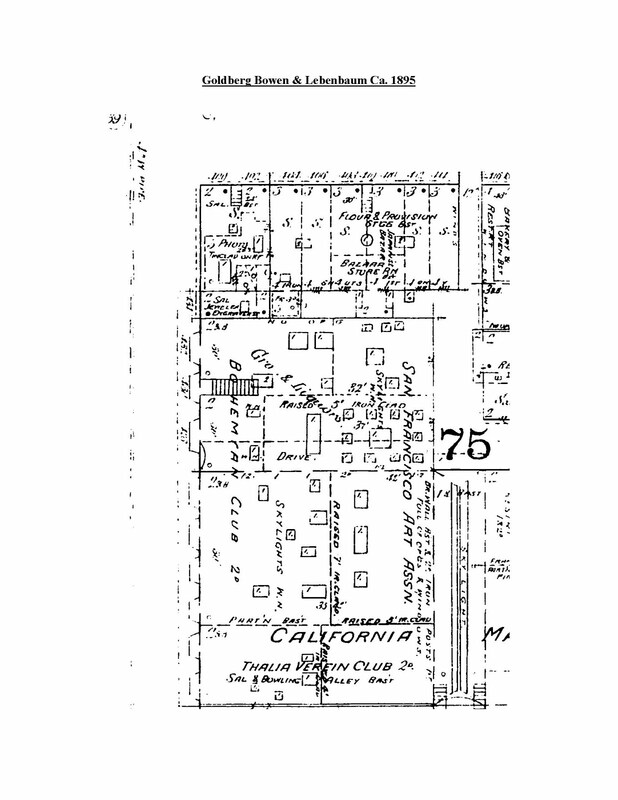 The 1897 Crocker Langley directory lists Louis as an importing grocer and tea & wine merchant in partnership with Jesse Meyerfeld located at 236 Sutter and residing at 1522 O'Farrell. Goldberg Bowen & Co. continued forward, weathering the setback caused by the Great San Francisco Earthquake and Fire of 1906, and remained prosperous as commercial and retail grocers, even after prohibition had forced most of the wholesale liquor dealers in the city to close their doors.